"As the third year that followed the year on thousand grew near, there was to be seen over almost all the earth, but especially in Italy and in Gaul, a great renewal of church buildings; each Christian community was driven by a spirit of rivalry to have a more glorious church than the others. It was as if the world had shaken itself, and casting off its old garments, had dressed itself again in every part in a white robe of churches." The Gothic Age (c. AD 1130-1530) marked the end to an age of chaos, primarily caused by the sacking and pillaging of the Vikings. After the great minds of Western Europe were freed from using their vast knowledge to defend against invaders or plagues, they now had the time and the resources needed to design any and everything in this era from bridges to city walls and castles to cathedrals. This was also a very religious age, with plenty of money being pumped into the Church, some from the crusades, with all of its included looting, and a lot more from all of the tithes all of the people who were born in the population explosion gave faithfully. Another even bigger source of income for the Church came to it in the shape of power and prestige, when the power of the church peaked in AD 1277. WriteWork contributors. 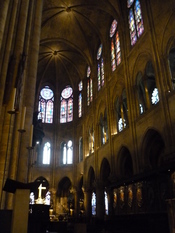 "Cathedrals and Religion" WriteWork.com. WriteWork.com, 01 December, 1996. Web. 21 Apr. 2019.
thnx, the essay has good resources. A comparative study of greek and celtic pagan religions, the variations between them and their demise through the Christian movement.